Without meaning it, a small seed had been planted and as I started to recover from the Fling I looked into the race details…. It would be a much smaller field than the Fling and arguably a more ‘intimate’ race. So I finally decided to do it and arranged an entry application with Karen (race organiser). I headed up on the Friday with my hungover sister for support. Unfortunately there was no room at the inn so we booked a hotel in Kirkmichael, a 20 min drive from Spittal of Glenshee. On arrival at the hotel we dumped our stuff and headed straight up to the Spittal of Glenshee hotel to check how far away it was and have a bite to eat. We also had a quick look around trying to work out at least a little of the route. The end of the route looked like it came straight off a hill – cracking way to finish. It was then back for a quick run to finally get the legs moving (after a 2-3 day taper) and some very average food from a ‘restaurant’ in Pitlochry – why is the Scottish hospitality industry so poor? We then went back up to the SoG hotel to register which would save us doing it in the morning. I immediately recognised Karen (and George) from the D33 in Aberdeen – I didn’t realise this was her race. Nicola, quizzed George about the CP’s and how best to find them and he kindly gave her some pointers. I was then in bed and sleeping for around 10.30pm (much to my sister’s surprise). Alarm was set for 4am. On race day I like to finish breakfast 3 hrs before the start – this was going to be less but was a sensible sleep / eat trade-off. Turns out I didn’t actually turn the alarm on but 2 mins after it was due to go off I woke myself from a nightmare that it was 10am and I’d missed the race. Funny how the mind works eh? The cramming of breakfast in a cold and silent hotel room is always the worst part of any race for me. Always makes me feel lonely and I’m not convinced that the body is ready for the porridge, bread, orange juice and egg onslaught when it was in deep sleep only minutes before. That said, my sister didn’t sleep on and kept me going with questions about what was going into what bag etc. That done, it was time for the big mix up! I am meticulous with my race day planning – food / fluids / drop bags / pace etc. We had already laid out the drop bags it was just a matter of adding the energy drinks, water, electrolytes etc. It is always a challenge in itself doing all this from a hotel room and it took a little longer that planned. But before I knew it we had emptied the hotel room and we were heading up the road to Spittal of Glenshee! We were expecting rain but at least for now it was dry and the sun was starting to peek through the heavy clouds. At the hotel I saw some friendly faces and many that I’d seen at the Highland Fling. It was a pretty relaxed atmosphere and I was really excited about the start. At 6.45 Karen did a short race briefing before walking us all over to the start of the race. It was a really pleasant walk and to me captured the essence of the race – people were laughing, joking, chatting and generally catching up. I met Louise (@goodonskis) for the first time who I’ve known only on Twitter – it was a nice place to do it in the calm before the race start. We joked about her minimal approach to gear – carrying only 2 x ipods and nothing else! We all crossed a stile (the first of many), stood around for a few minutes and then the race started quicker than most of us expected – we were off across the fields with some dark grey clouds at our heels. I’m usually a pretty quick starter (too quick) so I stayed at the front with 2 other runners. I knew who they were although it was unlikely they’d know me. A few miles in there was two of us leading by a few seconds. We shortly came into a field and couldn’t spot the next marker so we stopped for a minute and tried to work out where to go. We were then caught and the other runner headed off up a steep grassy hill. I went after him but near the top realised that the other runner had gone the opposite way. I decided then to turn round and saw that he was over 500m ahead but had at least found the route ( I hoped). Getting lost was my biggest fear as very quickly it could ruin my whole race. I was determined not to let him build a lead and within a mile I was back with him. This must have been Paul Hart – a super-talented runner and another racer I was honoured to be running with (after the Fling exploits – Jez Bragg, Andrew James etc). For the next 25 miles or so we were cat and mouse at the front. It was a real battle that I absolutely loved. The scenery was amazing, the terrain had everything and we were matching each other blow-for-blow. My sister and my folks were at every checkpoint and have become a super-slick support team. They know I don’t like to stop at all and they put up with getting just a few words from me on the most part. I had changed my fluids plan and it was working like a dream. They left nothing for me to think about or need. I looked forward to every checkpoint just to see how slick they were! I even stopped a few times and we had conversation and laughs. They’re an amazing crew! 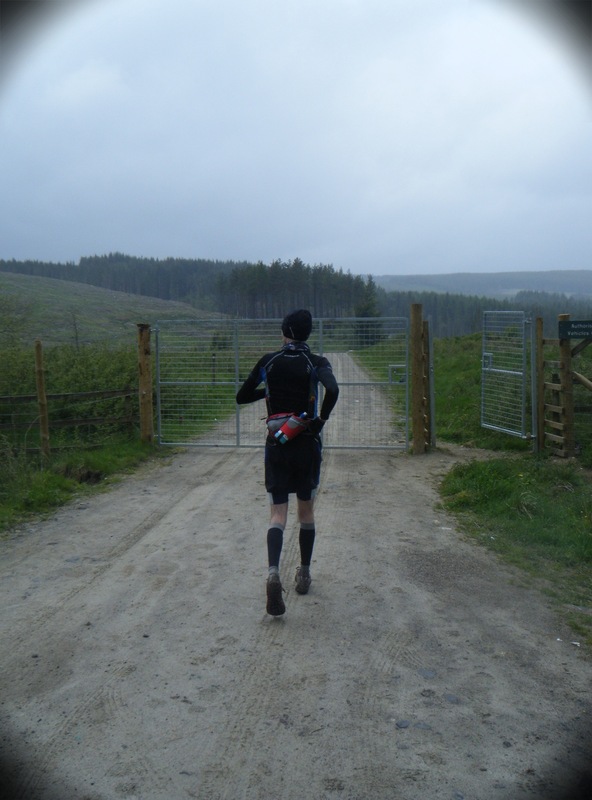 At the Den of Alyth (about 26 miles in) I was feeling strong as we both headed into the checkpoint area. I was determined to start pushing on so was back running again within 30 seconds. There was a half mile section through the woods and for the first time it felt like I was on my own. It was then straight into a long tarmac ascent – maybe for a couple of miles and I pushed on hard to try and create a gap. By the time I got back down the hill and into Blairgowrie it felt like I had a lead. Again I felt strong. Sank some more fluids, restocked, a little chat with the team and was off again. I had never lead a race before at this stage and I was a little nervous about missing a signpost and going the wrong way. Normally I’m heads-down and batter on but I needed to stay alert so I didn’t get lost and blow it. This was again a pretty hilly section with a mix of forest track, tarmac and field. By the next the checkpoint I thought to myself, there’s only one more to go before the final leg to the finish. So when I got to the Bridge of Cally CP I was pretty upbeat, having run the last section entirely on my own. My Dad said I was maybe a few minutes up, so I refuelled, picked up supplies and headed off again. This time into the rain. The next section was 11 miles of solo running. ‘Just keep moving’ was on repeat in my head. It was such a varied section with wide forest tracks, tricky heather covered climbs, marshland, single track, rocks, boulders and some of the tallest stiles I’ve ever climbed. I knew if I got to the next CP in the lead then someone would have a huge battle on their hands to get past me on the final 6 miles to the finish. So, with that in mind I just kept moving. People ask me what I think about when running for this length of time. I think about a whole host of things (other than just the race pace, pain, split time, food etc). Mostly I think about how lucky I am to be running – to be skipping around some stunning countryside (with like-minded people) truly is a joy. I know that sounds a little flippant or hippie, but running like this goes deeper than just another challenge for me. The penultimate section passed fairly well although it certainly felt longer than the 11miles in the race notes. Every time I thought I was nearing Kirkmichael it would climb again and skirt along the edge of a hill. Once past Kirkmichael I had just over 2.5 miles to the final CP. Again, I just kept moving. As I crossed the river which I hoped would take me into Enochdhu I finally spotted my Dad a few hundred metres in front of the CP – he gave me my electrolytes and told me that I was doing well. I chatted at the CP with my family and the marshall’s. The final section is a 5 mile climb to about 600m right through Glenshee then a steep 1.5 mile descent to the finish at the hotel. They asked if I’d done it before (I hadn’t done any of the course) and told me how hard it was. It didn’t phase me to be honest – if it was hard for me, it was also going be hard for anyone behind me (and I wasn’t going to give this up). I took on some extra fluids and set off up the hill. 6 miles to go!! One final gate and I could see the finish line 50m in front of me. It looked like they were holding a line / tape across – I must actually be winning this thing! As you can imagine I was absolutely thrilled, my amazing support team were whooping and shouting as much as I had been and I crossed the line on a total high, feeling as strong as I did at the start. I think I hugged everyone that was standing there and they all appeared to be really happy for me. I thanked Karen and the marshalls for the wonderful race they had put on, I took on some recovery fluids and after some more chat headed for a shower. As I walked through the hotel with my bag, people congratulated me – almost felt embarrassed about it as I don’t like fuss but I did feel pretty chuffed inside that finally I had some kind of small reward for the hard work I’ve put in on training. I know I’ve a long way to go and a lot of hard work to do to even get close to some of the talented ultra runners we have in Scotland / UK but on that painful 2 ½ hour drive home, for once I’ll admit to feeling happy that I’d at least given a decent performance. I checked my phone / twitter on the way home and was totally overwhelmed by the kind words / messages I received from family and friends (many of whom I’ve never met in the flesh –friends that is, I’ve met my family already ;)). That and the pride I saw in my family like I’ve never seen before, means I’ll keep pushing on in training and will be back again trying my hardest at an ultra event near you! Thanks again to everyone involved in this fantastic event, Karen and her team, the super-friendly runners, the staff at the Spittal of Glenshee Hotel (including the piper!!) and most of all my amazing support team (the ones that were there on the day and those at the end of a phone). Top job!! I’d also like to say a huge thank you to @GlasgowOsteo who’s treatments always manage to keep me moving – he does have evil hands though. This entry was posted on May 27, 2011 by pyllon. 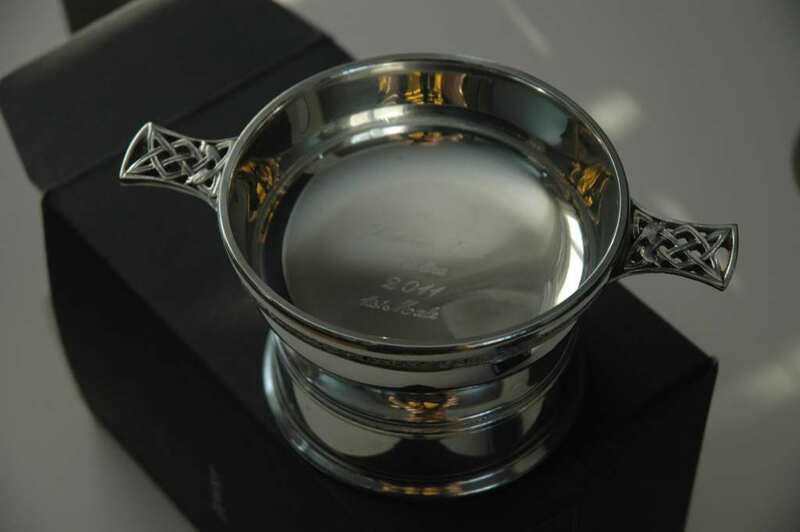 It was filed under 2011, Cateran Trail, Endurance, Offroad, Race, Results, Running, Trail, Ultra distance, ultramarathon and was tagged with Cateran Trail, endurance, hills, offroad, race, results, SUMS, trail, ultra marathon, ultramarathon. Thank you so much Sandra – I had a cracking day (as did my family). your lovign it and winning it !!!!!!! get innnnnnnn !!! You are too kind with your comments mate – it’s very much appreciated though!! Fantastic race and report. Well done to you. You are coming on leaps and bounds recently and certainly deserve the win. Thanks a lot Marco – that really means a lot coming from you. Hopefully I’ll get a chance to join one of your Kilpatrick runs this year! Thank you so much for all your support – means everything. Congratulations Paul. Must be amazing to win a race. Nice one. Was a super day – was very lucky. Congratulations on your race win and a fantastic report. I run myself (although nothing like the distances you cover!) and much of what you wrote struck a cord. Good luck with the training and here’s to many more future successes. Run and race for my local club, but am more of a track man. The distances you talk about are mind boggling to me, but I can certainly empathise with the feelings of exhilaration and achievement you talk about. Am looking forward to your next race report! Well done , i watched you finish anhd you looked fresh and well. Excellent report on an excellent race. Wow, wow, wow. Loved your race report and am so bloody impressed that you ran this, let alone won it! Fan-bloody-tastic, well done Paul, muchos kudos. Bit late in getting to this, but worth the wait. As others have said, a very humble write up of an extraordinary achievement. Inspiring stuff!